Schedule 13G - What Does It Mean? What is a "schedule 13G" filing? Why would an investor be required to file a "schedule 13G"? What is the difference between a "13G" filing and a "13D" filing? Investors who take a "significant" position in a company (anything over 5% of the total outstanding shares in a company) must file either a Schedule 13G or a Schedule 13G. A "schedule 13G" filing is reserved for "passive investors", or those who do not intend to "exert control" in a company. Schedule 13D filings are reserved for people or companies who may be interested in agitating for some kind of a change at the company, whereas "passive investors" are just that - passive. If a stake is greater than 20% of the company, or if the shareholder intends to take on a more activist role, then a Schedule 13D must be filed. 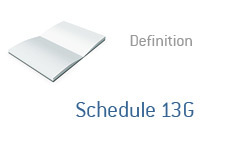 A Schedule 13G requires less information than a Schedule 13D.